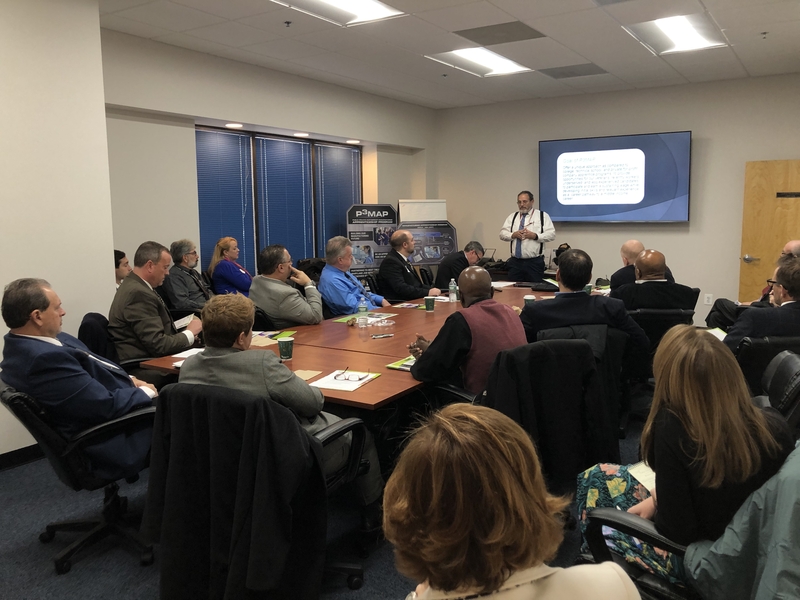 Regional Advanced Manufacturing Partnership of Maryland held its annual Legislative Breakfast on December 6, 2018, to brief local, state, and federal elected officials and staffers about the state of advanced manufacturing in northeastern Maryland and the new apprenticeship program that RAMP MD is exploring in conjunction with the Army. Local, state, and federal elected officials and staffers listen to Mark Schlein, associate director of Engineering at the Edgewood Chemical Biological Center/Aberdeen Proving Ground, as he describes the proposed RAMP MD/Army apprenticeship program. With an unemployment rate hovering around 3% in northeastern Maryland, local manufacturers are hard pressed to fine the talent they need. This demand has the potential to limit the growth of manufacturing in Northeastern Maryland, in the state, and across the U.S. RAMP MD, the Army, and many other organizations are collaborating on drafting a unique apprenticeship program that would contribute about 50 certified manufacturing journeymen each year. This non-profit State of Maryland certified manufacturing apprenticeship and training program, called P3MAP, would be hosted by the RDECOM ECBC Product Development Facility (PDF) at Aberdeen Proving Ground – Edgewood Area, leveraging the enormous capability already on site that supports the Army mission and readiness. For more information on the apprenticeship program, please contact RAMP MD by Email.